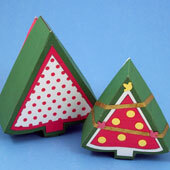 Make a novelty box for Christmas in the shape of a pine tree, with two sizes to choose from. 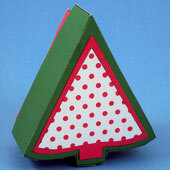 This is a cute gift box for small presents that will add some Christmas cheer wherever it is displayed. This box uses the banded box technique presented in the Oval Box with Lid craft project. Tip: Make the Oval Box with Lid first to learn this technique. If you are intrigued by boxes with novelty shapes, try making the box in the Valentine Heart Shaped Box craft project or follow the instructions at the end of this project to create a box pattern with a shape of your own design. 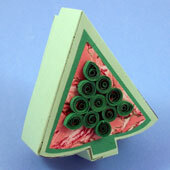 Optional: Decorative paper (wrapping, art, etc. ), spray adhesive. This project is rated DIFFICULT to do. Choose a box to make. Download and print the pattern. The smaller box pattern (3" by 2¾" by 1¼") includes both the box bottom and top. The large box (3¾" by 3½" by 1¾") requires separate patterns for the bottom and top of the box. Make a lightweight box by printing directly on cardstock. For a stronger box, print on computer paper, and trace or transfer the pattern to cardboard before proceeding. Cut around the box pattern pieces on the solid black lines. Try to cut accurately. The box will be stronger and fit together better if the cuts precisely follow the pattern outlines. Using a straight edge and craft knife will make some of the cutting easier, but be sure to protect the table with a cutting mat or thick piece of cardboard. Caution: Be careful. Craft knives are sharp and should not be used by children. Larger Box: The side strips for the larger box are in two pieces. Glue the two pieces together, using the glue tab to join them where indicated on the pattern. With a ruler or straight edge, make a score line along the bottom of the tabs on the side strip. At notches marked with a short line, score straight across the side strip from the notch to the other side. For the smaller box, there are seven marked notches, and for the larger box, there are three marked notches on each side strip piece. For the larger box, also score the glue tab line. To score: Turn the side strip pattern with the marked lines up. If you are using cardstock, use the bone folder or empty ballpoint pen to make an indent—not a cut. If you are using light- to medium-weight cardboard or poster board, use a straight edge and a craft knife or scissors to make a half-cut. Fold the tabs over, then unfold them to about a 90° angle. Fold on the seven score lines made at the notches. Fold the lines to match the direction, inside or outside, of the corresponding corner on the cutout. In preparation for gluing, bend the side strip around the tree-shaped cutout. Position the middle fold at the top of the tree shape. If the side strip is too long, adjust it by cutting a little from one end. If the side strip is too short, cut the tree shape down a little. Coat the inside of the glue tabs with a thin layer of white glue. 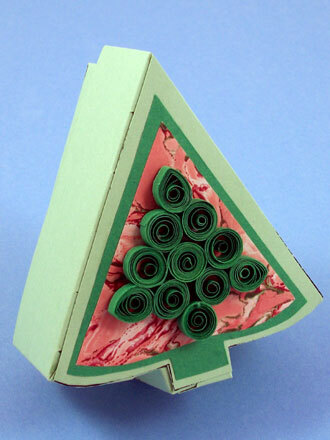 Apply a band of glue around the perimeter of one of the tree-shaped cutouts. Make sure that the band of glue is as wide as the depth of the tabs. Wrap the side strip around the cutout, pressing the glue tabs firmly in place along the sides, and into or around each corner. Apply glue to both ends of the side strip overlap and press them together. Finally, glue the other tree-shaped cutout in place to hide the tabs. Repeat steps 1 through 5 for the box top. Optionally, glue the insets to the second tree-shaped cutout. 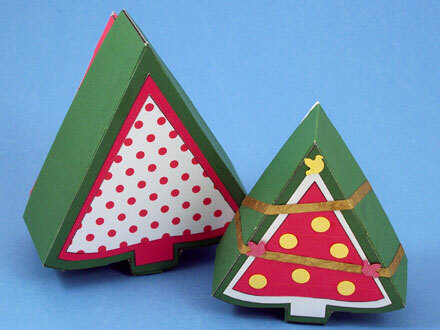 You may cover the sides of the top with decorative paper or ribbon prior to gluing the second tree-shaped cutout in place. Cut a strip of paper the same size as the side strip. Glue the decorative strip in place, carefully aligning the edges. Cut glue tabs on the other edge, fold and glue over existing tabs. Decorate the box top however you like! To give the box the look of a decorated Christmas tree, add thin strips of gold paper as "garlands," and circles made with a hole punch as "ornaments." It's fun to design and make your own novelty-shaped box and lid. The box requires a shaped cutout and a notched side band. The same is needed for the top, but the cutout is slightly larger and the notched side strip is narrower. Draw a shape to size for the box bottom. You can draw the patterns directly on the cardboard’s reverse side, or draw them on paper and transfer them to the cardboard. Determine the length required for the side band by wrapping a string around the edge of the shaped cutout. Measure the length of the string, and add about ¼" for overlap when gluing. The side band is a simple rectangle with cut glue tabs. Draw your rectangle the calculated length by any height you choose, plus an extra ¼" of height for the glue tabs. Draw a line the length of the band ¼" in from one side. Wrap the band around the box and make marks at corners and tight curves. At each mark cut a V-shape ¼" deep. All along the same edge, make equally spaced marks about ¼" to ½" apart. Cut a V-shape ¼" deep at each mark. Repeat steps 1-4 for the box top. Make the shaped cutout for the top about 1/16" to 1/8" bigger than the bottom, depending on the thickness of the cardboard, and make the depth of the side band about ¼" to ½" smaller. Follow the instructions in this project for assembling the box bottom and box top. 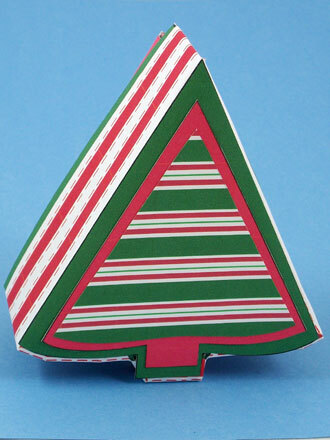 Tip: Use Aunt Annie's red and green stripes, green stitched stripes or red stitched stripes Christmas ePapers to decorate boxes and make gift tags. 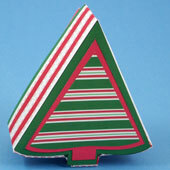 Tip: Use the Christmas Stripe ePapers to decorate the box. The sides of this box were covered with red stitched stripes and the tree inset was traced and cut from the red and green stripes ePaper. 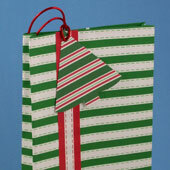 Tip: The Christmas Stripe ePapers can also be used to make Easy Gift Bags and coordinating tags. 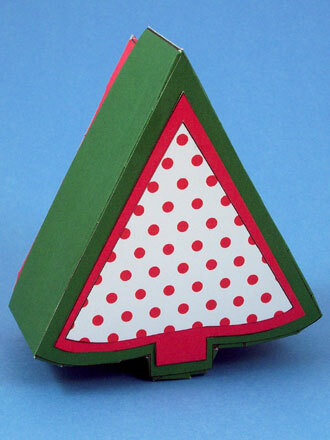 Tip: Glue layers of inset trees to decorate the box top. 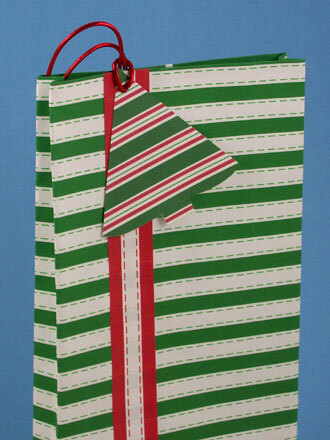 Tip: Use the Christmas Green and Red Dots, Christmas Red Dots and Christmas Green Dots ePapers to make coordinating Boxes and Bags or matching Gift Wrap. 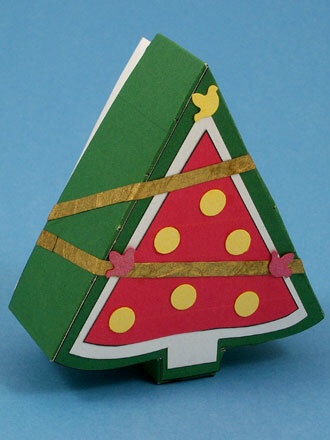 Tip: Decorate the box like a Christmas tree with strips of gold paper and punched circles. Tiny bird punches add a nice touch. 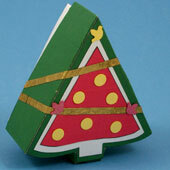 Tip: Use the inset patterns to cut shapes from fancy paper and embellish the box with a tree made of paper coils.